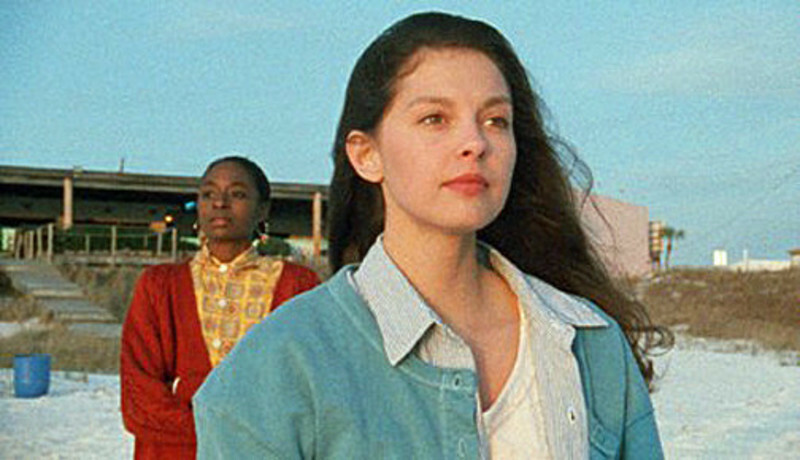 Ashley Judd: "Ruby in Paradise"
That girl, Ashley Judd, you can never catch her acting. -- Robert Mitchum, after seeing "Ruby in Paradise"
There are a lot of movies about people Realizing Their Dreams. Sometimes their dream is to become a big star. Or sleep with Robert Redford. Or walk on the moon. Or become heavyweight champion of the world. Or get the Force to be with them. "Ruby in Paradise" is a movie about a young woman whose dream is to succeed in retail merchandising. She gets a job in a beachwear shop in Florida, and she just loves it there. The movie stars Ashley Judd. The publicity identifies her as the daughter of Naomi and the sister of Winona--the singing Judds. Ashley, who is in her early 20s, is the acting Judd. She is so good in this movie that her character stops being a performance and becomes someone you feel like you know. She makes "Ruby in Paradise" the kind of movie that young people might actually learn from. The film was written and directed by Victor Nunez, a Floridian whose previous films, "Gal Young Un" (1979) and "A Flash of Green" (1984), showed an instinctive feel for the daily lives of ordinary people in the South. This time he tells the story of a young woman, played by Judd, who gets in her car and drives away from what seems to be a dead-end existence in a rural backwater. She arrives in the city of Panama City Beach looking for a job, and finds one in a shop run by a woman named Mildred Chambers (Dorothy Lyman). "We just laid three girls off," Mildred tells her. Ruby stands her ground: "Mrs. Chambers, I've done retail before. And I work real cheap." Mildred takes a good look at her, and hires her. The way to get a job, Ruby senses, isn't to ask people to hire you. It's to tell people to hire you. I saw "Ruby in Paradise" in September at the Toronto Film Festival, and the next morning I had breakfast with Ashley Judd and Victor Nunez. Talking to them, realizing this was Nunez's first film in nine years and Judd's first actual movie acting job, I was even more amazed at how assured the film was, how serenely confident of its story, and how to tell it. "I read the screenplay," Judd said, "and I had an extraordinary reaction to it. On this particular day I was going to four auditions, and Victor was the last person I got to see. I show up; I'm flipping madly through the pages, trying to even find my scenes. The casting director sees this and she says to me, 'Take your time, go home. Come back when you're ready. He'll want to talk to you about character.' I had been auditioning for a year and I'd never heard that before. So I went home and it took me more than 24 hours to read the script because I was so blown away I kept having to put it down. I cried on the couch, I cried in the shower, I cried in the bed..."
"Too bad you weren't the head of a studio," Nunez smiled. "We might have gotten it made sooner..."
The screenplay made her cry, I think, not because it wrings dramatic tears out of overwrought melodramatic situations, but because it is so true to the small moments of life, to the joy of getting your first good job, and the pride that prevents you from begging for it. And all of that Judd communicates without ever once seeming to strain for affect. Watching her act, and Nunez direct, is like watching one of those great Ozu films in which the actors didn't act, they simply existed, and life flowed through them. Where, I asked her, does someone learn to act like that? She sipped her coffee as if wondering if such a question had an answer. "I've known from the time that I was about seven years old that I was meant to be an actress," she said. "It was just a consciousness that I had. All of my imaginary life and inner workings were geared towards it. I know how to figure out what a scene is about, what it means to me, who the other people are to me and what I'm doing. And from there you just live out the scenes. Sanford Meisner called it 'living truthfully under imaginary circumstances'." She sure didn't grow up at the movies, Ashley said. "For the most part we couldn't afford it. But I saw 'Jaws,' and 'Big Wednesday' -- that was a surfer movie. And 'Bambi'." "Well, that was a choice that mother made. I was born in Los Angeles and we lived there until I was six, at which point we moved back to Kentucky because Mom figured that we weren't growing up like Kentuckians by osmosis simply because she was from eastern Kentucky. So we lived on the river and we didn't have a television and then we lived in a small community on top of the mountains..."
"I suppose that there are places like that but of course it's a very stereotypical image, a shack or a trailer with a great big dish. If you're ardent or strident enough about it, you can certainly get a signal. In the third grade we didn't have one; in the fourth grade we had one. I can go on cataloging the years in that manner but mostly TV just wasn't a part of our upbringing. We had different things to do with our time and with our minds. I was always encouraged as a reader. I think that encourages good acting because automatically you have to believe something that's on a page and have an emotional connection with it. I was never one of the kids who had to pretend like I was still in the bathroom so I could finish a chapter." "A couple of times when I was growing up it was a little painful because I wanted to be more like the kids who lived in subdivisions and I would have preferred my furniture to be from a department store rather than from my great, great grandmommy Burton. But that's what we had and that's what we were and mother was always proud and it sounds, I guess, like a little bit of a cliché but we were really happy and we loved each other. "It was hard sometimes, and we were hard on each other but I had a dream the other night that I was making a movie. I had $400,000 and I was making it about my family and somebody kept pressing me, 'What is it about, what is it about?' and I finally said, 'It's about our inexhaustible capacity to forgive one another'." "It sounds so corny but, I believe in bettering myself and reading and loving my family and respecting people and working very hard. I would say that I've got a really good work-ethic. My granddaddy ran a filling station and my other grandfather founded an aluminum-siding business in 1947. I know how long the day is and where a nickel comes from." "You know," Victor Nunez said, "the young woman who actually managed the store we filmed in, that was her story. We went back to shoot a couple of little quick shots for the very ending of the film, and she told us that she was going back to school, getting her degree in nursing. She'd been running the store for ten years and it was time now for her to move on." Ashley nodded. "We saw Ruby's story mirrored a lot in Panama City Beach. A lot of folks we came across, when they heard the story, whether they were the receptionist at the hotel or a clerk someplace, would say, 'Yeah, I packed up my car in 1981 and came here from Ohio. This is my story'." "But kids my age, they want to learn about something and where do they go to learn about it? To the movies. They don't go out to real life. And so they don't learn anything. Someone once said about the new young filmmakers, 'I've seen where they've been. They haven't been to anyplace that's real. They haven't been to life. They've been to the movies."